Eating well should be a lifetime goal for all of us, and seniors in particular need to focus on well balanced meals and nutritional support. It seems like the older we get, the more we need to go to the doctor. However, a healthy weight and regular exercise can reduce doctor visits substantially saving you or your loved one time and money. Does being older mean our diet needs to change? The answer is yes. This is because our metabolism changes as we age. Therefore, putting the right foods into our bodies helps give us a bigger return on the fewer calories needed to sustain the same weight. More importantly, the nutrients needed to sustain a healthy body must be carefully thought out when grocery shopping and cooking. Think of your plate as a rainbow of colors. Bright colored foods are best! Another important reminder is to keep checking the food expirations in your refrigerator. It is easy to let foods spoil when only one or two people are eating them. 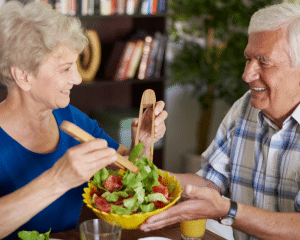 Older adults need to avoid food-borne illnesses that can result from unpasteurized dairy products, or undercooked eggs, fish, meat and poultry. These can become life threatening, so a good tip is to take a black marker and write the expiration date boldly as you put the food into the fridge; the dates are so small from the manufacturer that it is easy to miss. Store the items that expire soon closer to the door and try to use them first. Remember a food thermometer is your friend. When in doubt, take the temp to ensure the food is properly cooked. Diversified Resources is committed to ongoing education which is News You Can Use.